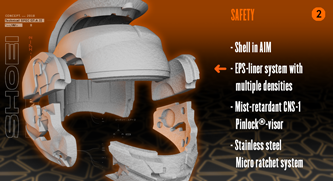 The sunshield was integrated into the helmet without any sacrifice in safety, by keeping the EPS liner at the same thickness, throughout the helmet. Also, Shoei is the first helmet manufacturer that has approved the sunshield according to the DIN EN 1836 standard. This is the European standard for sunglasses.